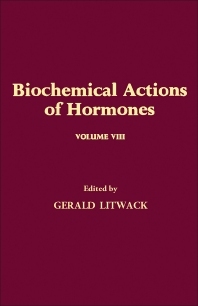 Biochemical Actions of Hormones, Volume VIII is an eight-chapter text that covers the developments in the understanding of the biochemical aspects of hormonal action and regulation. This volume examines first the messenger functions of calcium in hormonal systems. The next chapters deal with the neuronal regulation of blood pressure; the regulation of protein synthesis by phosphorylation; and the hormonal control of hepatic gluconeogenesis. These topics are followed by discussions on the effects of insulin in intracellular functions, the mechanisms of steroidal hormones, and the membrane recognition and effector sites in steroid hormone action. A chapter focuses on the activation of steroid-receptor complexes. The final chapters survey the estradiol and progesterone receptors in the human endometrium. This book will be of great value to biologists, biochemists, and researchers in the field of hormonal action.